I counted over 90 people in attendance at the public meeting about the future of the cattle market, held on Monday, 8th July at the British Legion. The purpose of the meeting was to gather residents' views about ways forward, to be sent to ELDC, who are commissioning a report. "There will be no public consultation after the report", Councillor Andrew Leonard told the attendees. Figuring out alternative ways for ELDC to make money from the site, rather than selling it, was high on the agenda. The 5-acre site has been in ELDC's possession since 1974, but as a result of a royal charter the town must have a cattle market. There are no rules about how large or viable that market must be. Councillor George Horton was the first to suggest refurbishment. He described the site as "in a poor state of repair" since the foot and mouth epidemic of 2001. "What they've done in the cattle market is absolutely nothing." His call for more investment and refurbishment in the site was greeted by a round of applause. "I don't think ELDC are going to be happy if they have to build another cattle market" said the Mayor, David Wing, who chaired this meeting. Councillor Sue Locking raised concerns about the location of another cattle market, should ELDC choose to sell the current one. "We can't guarantee it actually will be in Louth," she said. Alan Mumby of Keep Louth Special said "What worries me is the consultation." He referred to Nick Louth's rebuttal of the Nathaniel Lichfield survey. The district council commissioned planning specialists Nathaniel Lichfield at a cost of around �25 000 to do a study of the town's retail prospects in 2012, a report which Nick Louth resolutely put the boot in on. "We're spending money to get a proper document," Mr Mumby said. Then a resident called John got up and protested about the transfer of the site to ELDC in 1974. "It belongs to the people of Louth," he said. A resident called Thornia Edgars asked "who is in the running to take over the cattle market?" "We just don't know, and they won't tell us," was Councillor Leonard's reply. Nick Louth explained the process in more detail. "The planning applications are made anonymously by a front organisation. It is fair to say every supermarket would be interested." However, he qualified that statement somewhat, citing the planning permission for stores on Queen Street, and the possibility of a new Aldi in town. "There's very much a move towards smaller supermarkets." Jackie Featherstone was another person to criticise ELDC's care of the site. "Every time they want to get rid of something they have this habit of bringing it into disrepair." Town and ELDC Councillor Jill Makinson-Sanders criticised the process, saying "This is not a consultation at all. This is about how they are going to market the site." One Newmarket resident pointed out that she was not allowed a satellite dish, plastic windows, or other things that would spoil the conservation area. "A supermarket does not fit in with that, it's double standards." I think it would be fair to characterise the mood in the hall as negative towards the district council. 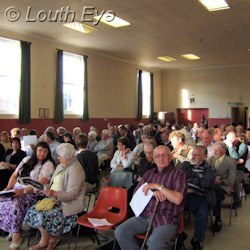 Brian Heal, a resident since 1963, said "Louth has gone downhill since ELDC took over. They're not listening to us at all." "If you lose the market it will be a bigger blow than when you lost the railway," another resident said. "We do have ideas," Nick Louth said. "They [ELDC] don't want to listen." "Some things should be above commercial greed", said Pat Metcalfe. Nicholas Pope of the NFU explained what he'd heard from the farmers he had spoken to: "Farmers fall into two camps, those in favour of retaining the market, or those with no opinion." Look out for a petition on the cattle market in the near future, particularly since there isn't a proper public consultation scheduled after this meeting.